You are here: Dennis Williams Realtors Latest News Newsletter: Lifestyle House or home, transforming your house into a home. We see a home as your very own place; a space that is loved and lived in. If you are moving house, follow our guide to transforming the empty house into a home you can enjoy. For those readers who are house-hunting, we hope this list will help you to envision the potential of the houses you check out. When we were buying our very first house, my wife and I had been renting for years. Living in rental houses means you are limited in what modifications you can make. And so, we found ourselves living in a series of beige spaces. After buying, I told my wife to go wild with choosing colours for the various rooms. She chose bold, yet tasteful colours for each space. Guess what? It had a remarkable effect! At last, we felt we had a home that reflected our own style and creativity. This is a great way to start making the space your own (preferably before you start moving in the furniture). "You gotta know when to hold 'em, know when to fold 'em." What Kenny Rogers sang about poker rings true for furniture, décor and other items you can choose to bring over to the new place. Moving house is a great time to sell or trash those items you don't love, giving you a clean slate. But be sure also to place your favourite items in the new home. You will feel an immediate personal connection with the space. One brilliant example is a tasteful photo wall or standing display. What makes a house feel empty and not lived-in is plain, echoey, tiled rooms and floors. Adding some stylish carpeting and curtains immediately cancels the feeling of rattling around in the space, and warms up the home. This could mean installing wall-to-wall carpets or placing rugs that you love in strategic areas. Many of today's houses are fitted with cost-effective down-lighting. Kitchens and bathrooms may have stark fluorescents. To make the place feel homier, you should think about adding tabletop lamps and standing lamps. These lower light fittings angle the splash of light into all corners of the room, creating a warmer effect. Choose warm-coloured energy saving light bulbs for best results. In bygone years, each section of the house was enclosed. The trend lately is to move towards open-plan arrangements - and with good reason. An open plan kitchen and dining area or lounge arrangement, for example, makes cooking a fun, social activity. Families or guests can interact with the person doing the cooking as they prepare their masterpiece in the kitchen. 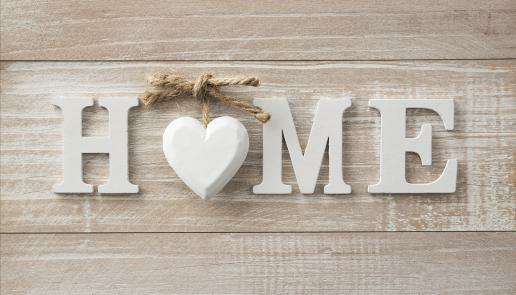 This kind of thinking is precisely what makes a house a home. Think of ways to use the space for day-to-day socialising and making great memories. In this way, you can maximise your enjoyment of those hours you spend together in the house. Practical ways to do this include setting up entertainment areas, having a space for board games or puzzles, and setting up a play area for young children which adjoins an area in which adults can relax. And don't forget to utilise your outdoor areas for play and entertaining as well! With these steps in play, you will quickly feel your house has become a well-loved home.